Generously grease bottom & sides of a 9-inch springform pan with butter. Add crumbs & tilt the pan to coat the bottom & sides. Leave loose crumbs on the bottom. Beat egg whites until stiff peaks form and set aside. Drain cheese in a fine mesh strainer to eliminate water. Place in a food processor and process for 2 minutes until smooth. Transfer cheese to a mixing bowl. Beating on medium-high speed, add eggs one at a time. Slowly add sugar and vanilla. This process takes about 5 minutes. Reduce mixer speed to low & stir in flour and zests. Using a spatula, gently fold in egg whites. Pour into pan, smooth the top and bake for one hour or until a knife inserted in the middle comes out clean. Cool completely in the pan (2 hrs.) on a wire rack. Refrigerate before serving. Notes: For more on this recipe in my blog click here. 26 Comments on "Light as a Cloud Ricotta Cheesecake"
I cut down to 3/4 c of sugar and it tasted just as good and more fresh. Putting a sheet pan on top of the cheesecake pan like a lid can also help with cracks. Can I make this recipe with no sugar? I am trying to make this cheesecake that my boyfriend and I had in France… it was beautiful – a farm cheese & ricotta cheesecake with no sugar except for in the biscuit/ graham cracker crust and the blueberry compote on top. 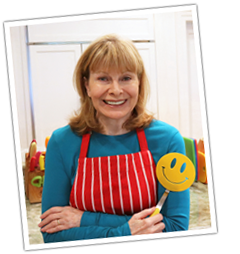 It has been impossible to find a recipe with no sugar/ sugar substitute! I am hoping to surprise him on Valentines day. Jenny, I have a question about the cheesecake. Do you cool in the pan two hours, or remove from pan and cool? Thanks for clarifying. Thanks for all these wonderful recipes! Cool in the pan (I have clarified the recipe). This looks like a very nice cheese cake. I’m wondering if you’ve tried (or if anyone has) Stevia instead of sugar (either in total or part)? My husband is from Italy and his mother always made her ricotta cheese “pie” with anisette in place of the vanilla extract. Also, she would cook a half cup of white rice, let it cool, then add to ricotta mixture. Although she is deceased, her recipe is made annually at Easter and Christmas. I’m looking forward to making your version Jenny with the addition of our beloved anisette and rice. I have recently discovered your website and excited to try so many of your recipes but having a difficult time deciding which ones first. Thank you for taking the time to do what you do. God has blessed you with a wonderful talent and now you are a blessing to others. Sincerely thanking you with a greatful heart. Hi Jenny, I made this wonderful cheesecake but it cracked on the top for me. What did I do wrong? Was it overbaked? It’s not unusual for cheesecakes to crack but there are a few reasons: baked too long, the pan not greased enough, cooling it too fast, etc. You can find lots of tips online on avoiding the cracks if they bother you, like using a water bath, but when my cheesecake cracks, it doesn’t bother me – it still tastes the same. On your Ricotta Cheesecake, can you substitute almond extract instead of vanilla, or will that change the taste? 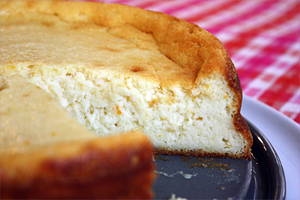 I am Italian, and my family love ricotta, and this is such a healthier version of regular cheese cakes. It will definitely change the taste and it’s not a spice that I would use with this recipe but I see there are other recipes that use almond extract with cheesecake. In response to the Almond extract.. Using Amaretto is the better alternative since it does have a hint of Almond.It is used in many italian pastries and cakes. Can you help me out please? How much is 2 pound part ? Do you mean 2 pound of ricotta? Sorry, i live in Holland and would like very much to make this cake. I see the confusion. It’s two pounds of ricotta cheese. The one I use is called “part-skim” ricotta because it’s lower in fat. aha! 🙂 thank you for explaning. im going in my kitchen now! Just got this in the oven and can’t wait to share with my loved ones tomorrow. Thanks Jenny and have a great Holiday. Can I use cream cheese instead of Ricota Cheese??? Is it must to make cheesecakes in springform pans?? I have never used cream cheese but it’s heavier than ricotta so it’s probably better to look for a regular cheesecake recipe since they mostly use cream cheese. And without a springform pan, it would be almost impossible to remove a cheesecake from a regular pan. I make this cheesecake every month. My family, friends are just love it. Easy, quick to make. The cake is light as a cloud. Thank you Jenny a lot! Great ! and ricotta is available in many types here in …BUT I still prefer to see this in video ! !